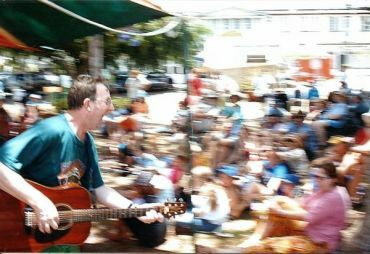 Bruce Watson (Vic) is a major Australian songwriter and performer in the folk tradition, regularly playing at festivals and other venues throughout Australia. He will be launching his latest CD, 'Balance' on this trip to Sydney. Bruce has received heaps of songwriting awards, including the Declan Affley Memorial Songwriting Award at the National Folk Festival for 'Amazon', which has been recorded by Eric Bogle and several other artists. He has also won Port Fairy's Lawson-Paterson Songwriting Award and Maldon's Roddy Reed Songwriting Award. He has a keen sense of the absurdities of life. Nothing is sacred, but many things are precious. A concern for people, the environment, reconciliation and for life's mysteries and ironies runs through his songs. His serious songs are both moving and challenging, and he is not afraid to tackle the hard issues. His humour can be sharp - or just plain silly. His act is one to be seen as well as heard, with plenty of audience involvement. 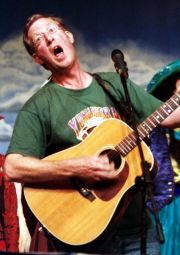 Scourge of politicians and the pompous, weaver of fine and moving tales, and winner of numerous songwriting awards, Bruce will make you laugh, cry - and think. Jenny Fitz just loves singing and loves the skill of those who have written wonderful songs that deserve to be shared. This is her excuse for a repertoire that is like a song addict who is Attention Deficient! For her "did you hear the one about ..." refers to songs more than jokes. She lives in Maleny - the cooperative capital of Australia - and is keen on songs that help to either prod or sooth us into checking that our actions are in line with our values. But that doesn't reduce her attachment to songs born of heartbroken states induced by unrequited love and tragic folkness! Jenny was born in Ireland and now lives in Maleny (QLD). She has an amazing collection of of songs - traditional, contemporary and topical. Her love of a good search and flair for marrying the traditional with the current has brought about some wonderful additions to the folk pantheon. Her rich interpretations of traditional repertoire highlight her distinctively powerful and emotive voice, whether unaccompanied or when fronting bands like Tulca Mor. 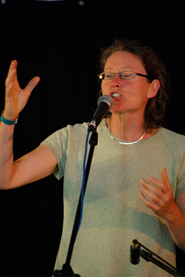 In 2001 Jenny was awarded the Liz Johnston Memorial Award for Vocal Excellence at that National Folk Festival in Canberra. Photo of Jenny courtesy of Mark Laidler.